Of all the places to visit in North Carolina, we get the most questions about how to spend a weekend in Asheville. I wonder why, considering it’s packed with some of the most amazing food, the state’s best beer scene (I said it! ), well-preserved history, and more things that make it the center of the universe for those traveling to the mountains of our state. 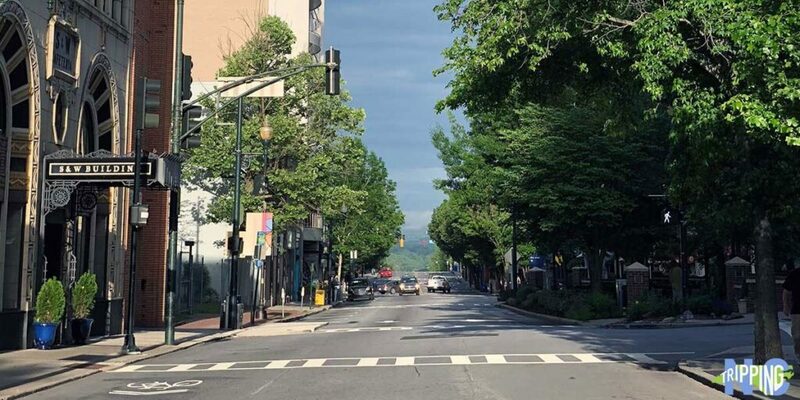 We know you most likely want to live in this awesome town, but let’s start with a couple of days and give you the basics on what to do, food, places nearby, and more when enjoying a weekend in Asheville. Asheville’s mountainous surroundings and climate boosted it as a prominent health center in the 1880s. That’s largely thanks to the railroad coming through. The relatively mild weather attracted folks like George Vanderbilt, whose Biltmore Estate remains a testament to Asheville’s first boom. In a twist of fate, city officials didn’t have the money for urban renewal following the depression, so that’s why many original buildings are still standing in Asheville today. In typical Asheville style, Marla Hardee Milling’s Only in Asheville delivers a truly eclectic history, as described in the subtitle. Spring at Biltmore Estate is pretty nice, huh? Thanks to that mild climate, Asheville is great to visit throughout most of the year. However, it’s possible to visit during most of the year, including around Christmas when you should absolutely go check out Biltmore Estate. Summertime is nice but the spring and fall are equally cool. That’s mostly because of the blooms and foliage you’ll find when visiting Asheville during those times of the year. Personal Tip: Since the place can get a little busy on the weekends, I think you should spring for a day or two from work and do a Sunday to Tuesday stay. That way you can park Downtown with more ease. 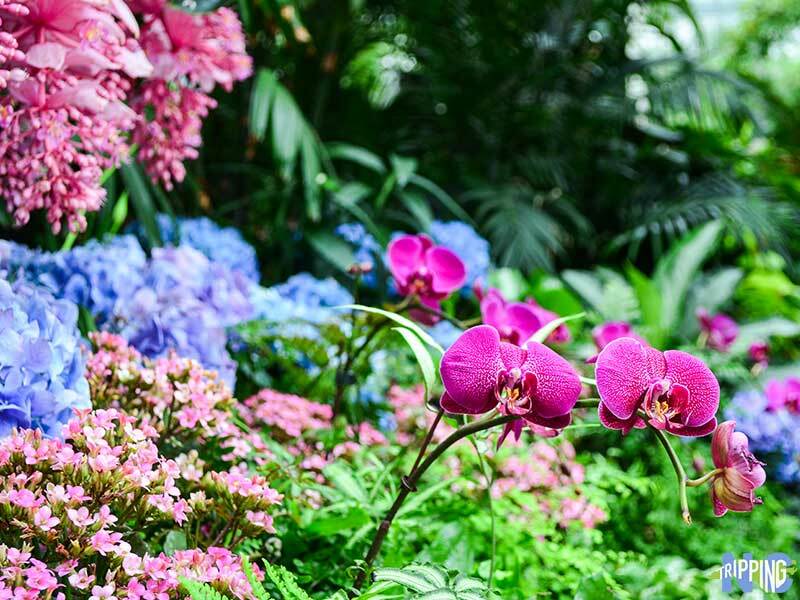 We enjoy Biltmore’s flowers so much, that we included them as part of our Spring Things to Do in North Carolina! So many hotels in Asheville to choose from, yet which one should you pick for your weekend? If you’re seeking a larger outfit with valet and all the perks, a place like Cambria will be what you want. For a cool-looking Bed and Breakfast within minutes of Downtown and Biltmore, check out Cedar Crest Inn. 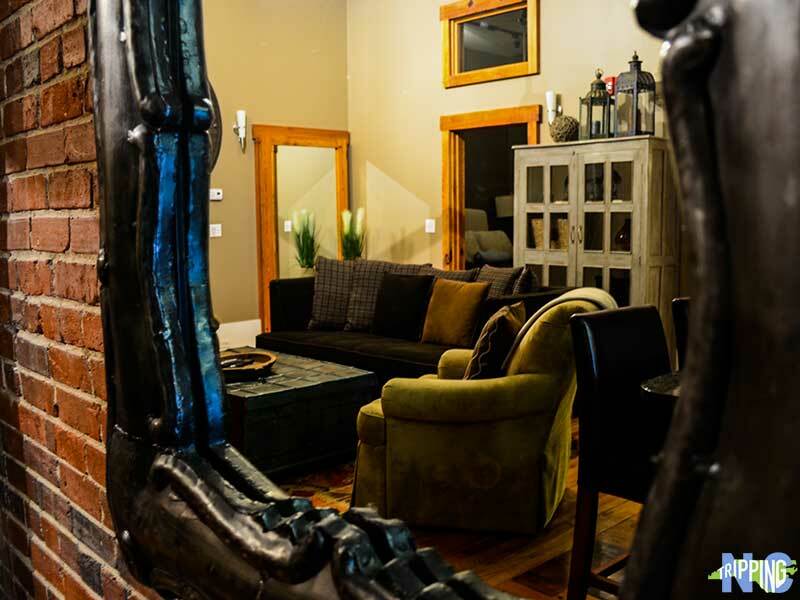 And if you want to blend in with the rest of the city and still stay in style, a place like Loft 101 is right up your alley. That last one is one of our favorite places to stay in North Carolina, so we’re a bit biased. You can easily spend your whole weekend in one part of Asheville, so we’ve broken things down based on Downtown, Biltmore Estate, the River Arts District, and West Asheville. If you’re looking at Asheville’s surroundings, we’ve got you covered, too! What are your favorite things to do in Downtown Asheville? Let us know if we left something out. Known as “America’s Largest Home,” the scale of Biltmore Estate seems hard to believe at first. There’s no need to pinch yourself upon arrival because it’s totally real. Start with a tour of the immaculate 250-room house. After you’ve imagined how you’d utilize each room as your own, head outside for a walk around the beautiful gardens that surround the house. Here, you’ll see even more detail and care taken by those who work hard to preserve and maintain the estate. Finally, you can top your day off with a tasting at Biltmore’s historic winery and take at least a bottle or two home. Visiting Biltmore for their Christmas celebration should make your list of winter things to do in North Carolina. 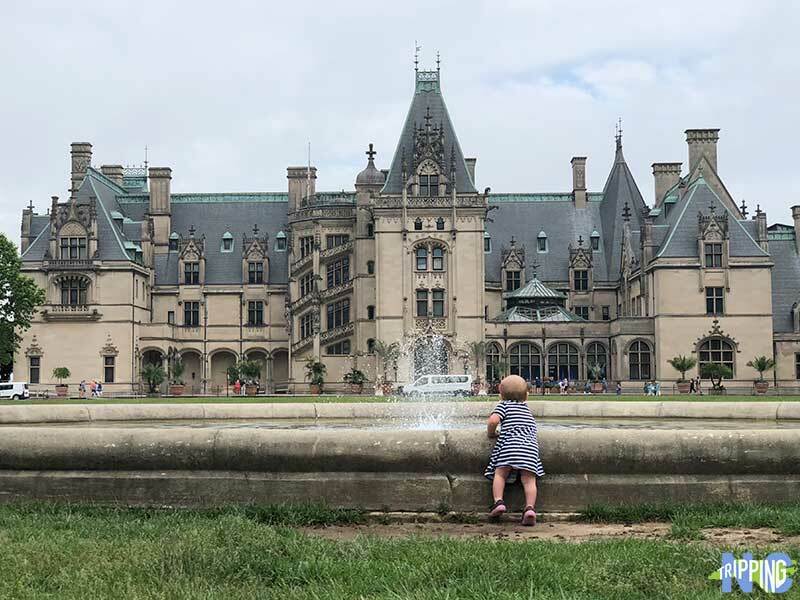 Also, we came up with a dozen things we love about Biltmore Estate. Drive on Haywood Road through West Asheville and you’ll see colorful buildings filled with restaurants, quirky shops, and more fun things to explore. 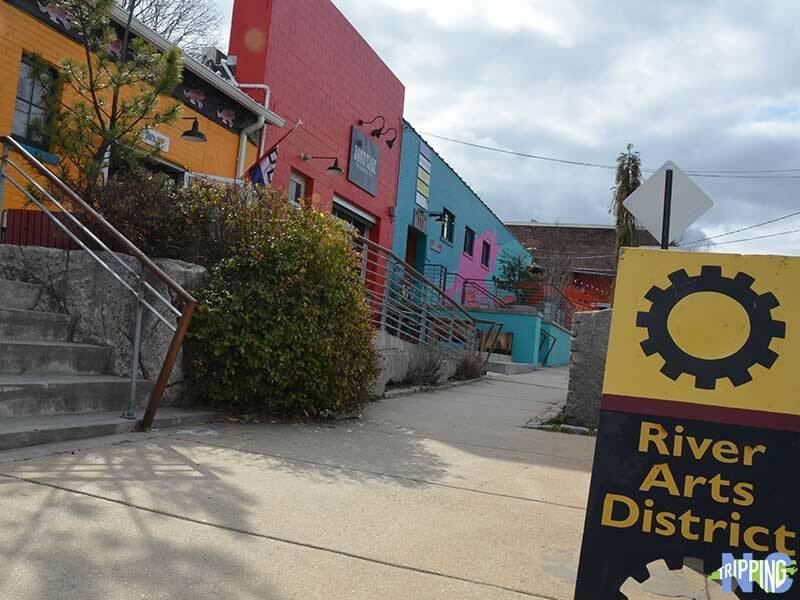 The Asheville River Arts District (RAD) is packed with more than 200 artists working in more than 20 former industrial buildings. We toured the area and learned about its history, meeting with some excellent artists who really make this area special. Prominent names that you should check out include John Almaguer (Glassblower and our tour guide), Stephen St. Claire (Dialuminist), Daniel McClendon (Fine Art Painter), and Andrea Kulish (Pysanky Artist). 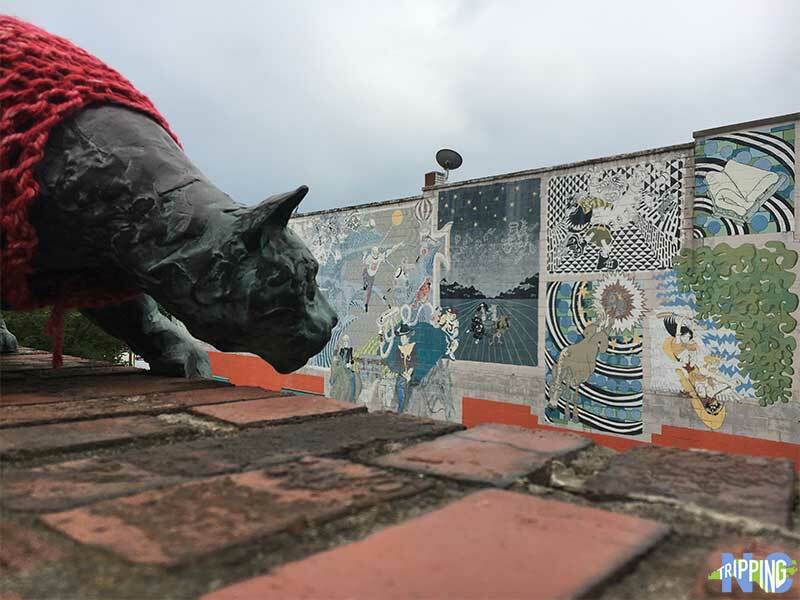 We suggest you join one of John Almaguer’s Asheville Art Studio tours if you’d like a great rundown of the River Arts District. Have you ever been? It’s hard to believe, but there are even places to explore Asheville’s art scene beyond RAD. In Downtown, the Asheville Gallery of Art, Ariel Gallery (jewelry, ceramics, glass, and more), and Woolworth Walk (I’m a sucker for soda fountains) are great spots. If you’re keen for some Blue Ridge Parkway exploration, check out the Folk Art Center (Mile Marker 382). When someone asks about places to eat in Asheville, it’s hard to not name off dozens of spots. One way to get a nice sampling of restaurants in Asheville is via a Taste Carolina Gourmet Food Tour. But if you’ve got time, bear with us as we narrow it down for your weekend. I’m still reminiscing about the hummus and tasty creations found at Jerusalem Garden Cafe. 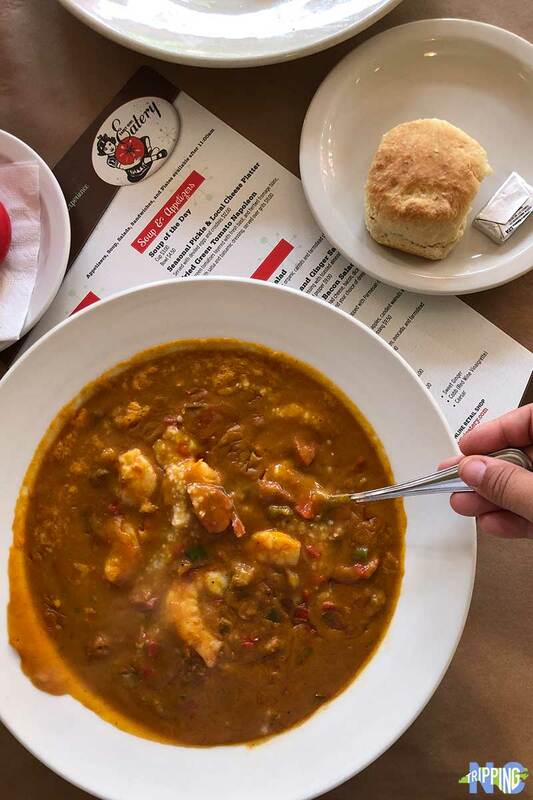 Early Girl Eatery made some of the most delicious shrimp and grits I’ve ever eaten. Just down the street, Well Played serves awesome food with a massive collection of board games. 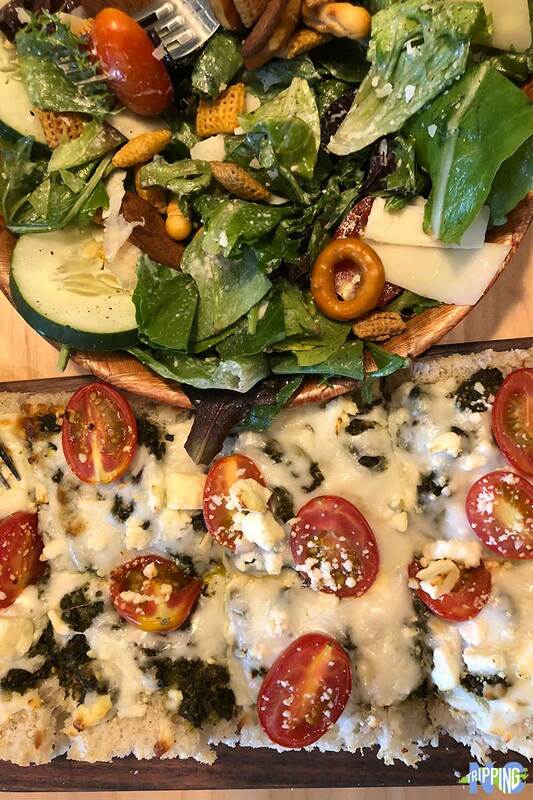 Well Played has an awesome collection of board games, but also some great food! Of course, we can’t forget places like Biscuit Head and White Duck Taco, but we’re going to stop at that for now. Stay tuned as we’ll share our favorite restaurants in Asheville very soon! We love the wide open spaces at Sierra Nevada! I’m blown away by the sheer number of Asheville breweries to explore. Big names and smaller ones stand side by side throughout the city and on the outskirts. Wicked Weed Brewing is one of our favorites in town, especially if you walk around back and hang out outside. One World Brewing is pumping out great stuff from their Downtown and West Asheville locations. Wedge Brewing Co. in West Asheville is another one you should check out. Of course, there are the huge names that call the area their second home—New Belgium Brewing and Sierra Nevada Brewing Co. Both have different setups but are great for hanging out alone or with friends. The latter is a bit of a journey away from town, but not too far away. If you’ve had the chance to visit, what do you think are the best breweries in Asheville? We included a few of Asheville’s best among our favorite North Carolina breweries. 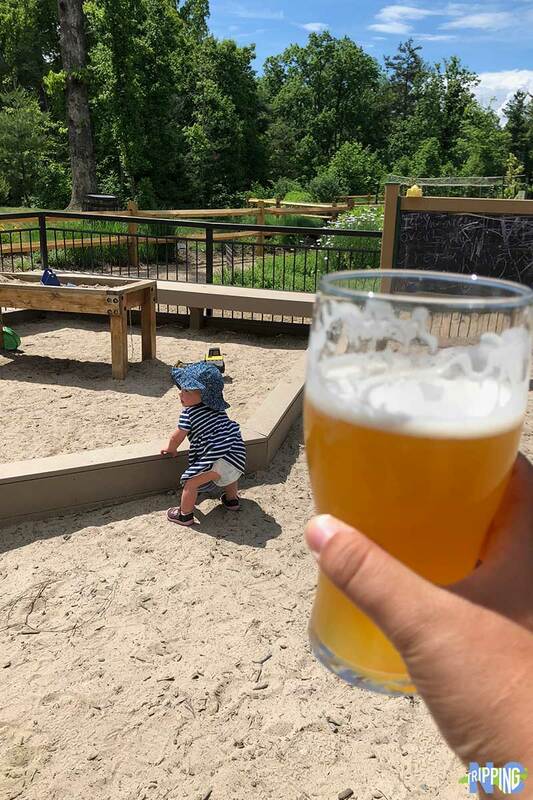 The city’s beer scene makes up a big part of our collection of Unique Things to Do in North Carolina. If you must, get out and around Asheville and get even more from the city’s surroundings. Hop on the Blue Ridge Parkway and stop at the many beautiful overlooks and viewpoints it offers. There are also some fun hikes in the mountains around Asheville. 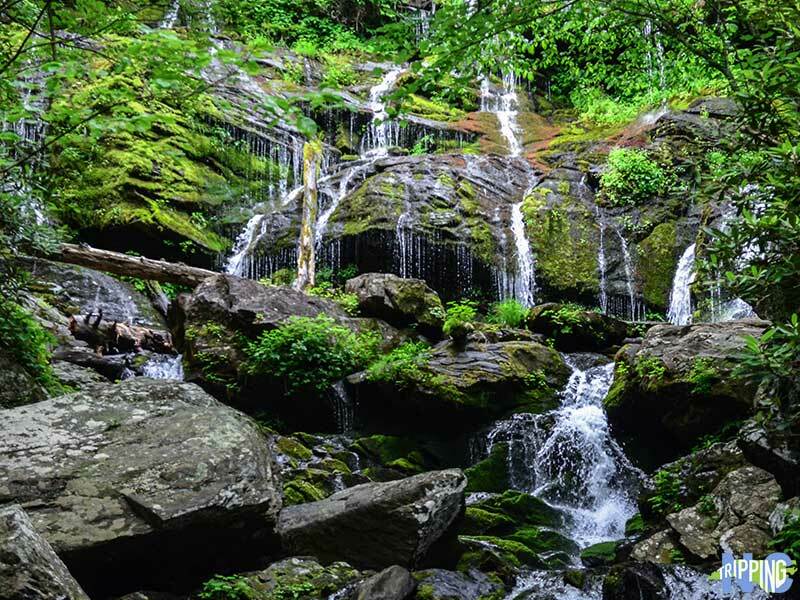 Some really cool ones include Looking Glass Rock, Craggy Pinnacle, and Catawba Falls. You’re also not too far from some pretty awesome mountain towns like Brevard and Blowing Rock, depending on which direction you go. We included Craggy Pinnacle among our favorite fall hiking trails in North Carolina. What else made the cut? Read here and find out. Are you ready for an awesome weekend in Asheville now? We’d love to know how you enjoyed this special town because it’s always nice to keep tabs on one of our favorite cities in North Carolina. Please let us know how it went or feel free to profess your love for Asheville in the comments section below! This entry was posted in Travel and tagged Asheville, Blowing Rock, Blue Ridge Parkway, Brevard, Buncombe County. Sounds like a great weekend!! I need to check this place out! Thank you, Shay! Asheville is a great place to spend a weekend or more. Hope you can get there someday soon. I lived in Asheville for three years. It wasn’t nearly enough time to see and experience all the wonders of the area. I fully intend to return! I just wanted to say, this article made me home sick BUT it’s an excellent cross section of what Asheville has to offer. Thanks so much for your kind words, Angela! Asheville most definitely is something special. We hope that you get to come back for a visit soon!